NASA’s Mars rover may have been pronounced dead after 15 years on the Red Planet, but its legacy will live on through one final photo of the barren Martian lands. Communication with Opportunity was lost on June 10 last year, when a planet-wide dust storm — one of the most intense in decades — hid its location. After more than 1,000 attempts to reconnect, the space administration last month conceded it was not coming back. Scientists have now released an insight into the rover’s final moments before it was blanketed in dust — one last photo, sent back to Earth. Taken over the course of 29 days, the 360-degree panorama shows what would become Opportunity’s final resting spot in Perseverance Valley. 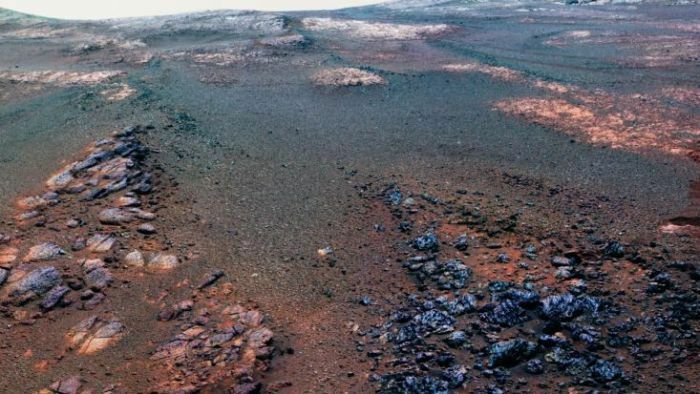 “This final panorama embodies what made our Opportunity rover such a remarkable mission of exploration and discovery,” NASA’s Opportunity project manager John Callas said in a statement. “To the right of centre you can see the rim of Endeavor Crater rising in the distance. The panorama is composed of 354 individual images taken from May 13, 2018 until June 10, 2018 — or sols (Martian days) 5,084 through 5,111, according to NASA. Opportunity was easily the longest-lasting lander on Mars — despite being designed to last just 90 days — and set a roaming record of 45 kilometres before coming to rest. It lost its identical twin, Spirit, which was pronounced dead in 2011, a year after it got stuck in sand and communication ceased.